Leaving at Lightspeed: The number of senior women in tech is decreasing | The Forum Network, hosted by the OECD: Shape ideas. Shape policy. Shape the Future. The number of women in tech in the United States has declined steadily since 1984; further, women are underrepresented in the field in the majority of countries. 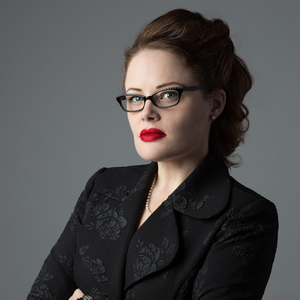 Tarah Wheeler, author of Women in Tech, explains why this matters, why you should care and what you can do to help. 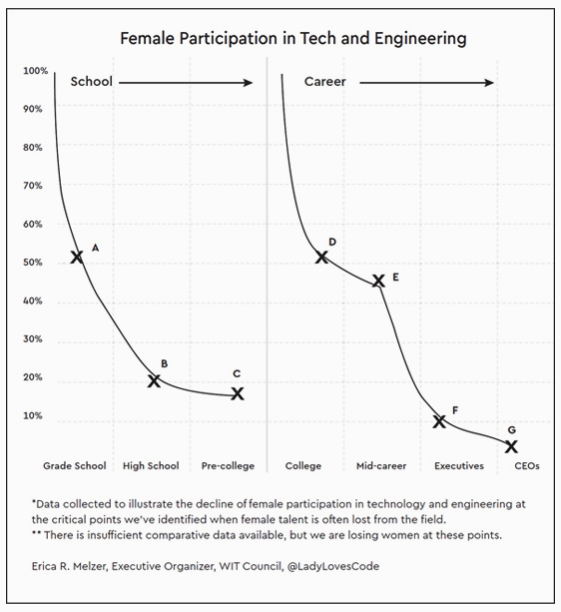 The outlook for women in technology in the US and beyond is bleak. Women are leaving the field faster than they are entering it. What can we do? A few bright spots exist. With more than 260,000 female tertiary ICT graduates in 2015, India is the closest country – followed by Indonesia – to actually achieving gender parity in STEM (science, technology, engineering and maths) college graduates. While there is hope as more young women around the world are being made aware that STEM can be a wonderful vocation, there is a cold reality forcing women out of tech at every level of their career: they will not be promoted or given the same chances as men. There is some disheartening news for women in tech: the number of us in technology is decreasing every year in the United States and beyond. 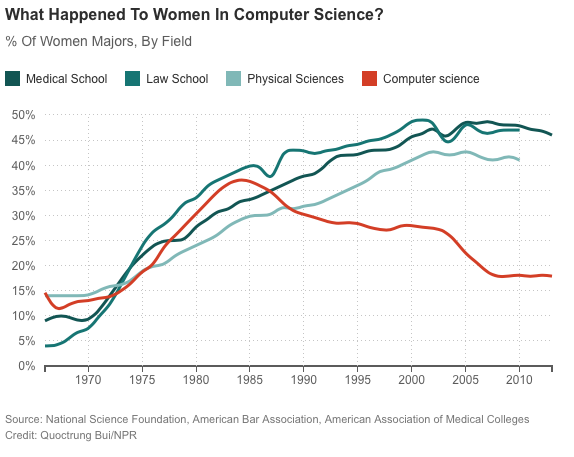 1984 was the high point for US women in this field; 38% of computer science degrees were awarded to women that year. Every year since, women have left technology in larger numbers than they have entered it. At every critical moment in a tech career (starting primary school, embarking on secondary education, applying to technical post-secondary programmes, gaining internships, initial hiring, mid-career advancement, and the crucial transition from mid-career to senior executive leadership), men are twice as fortunate as women at being awarded those key advancement milestones. Unfortunately, not only are senior women leaving tech after being denied promotion, but the rate at which senior women exit may actually be increasing when perceived “executive presence” and personal networks start becoming the more important factor for promotion. I will never forget the time I had been thoughtlessly excluded from the all-male C-suite poker game at a previous company…and I am a poker player. A mentor of mine had a quiet conversation, and I had a path upwards. Those moments of mentorship and collegiality matter hugely. Sexual harassment scandals aside, at every level of a woman’s tech career there are half as many female role models to follow than the level before. Overall, there are fewer and fewer role models for women at the top of the field, and as someone who has personally seen promising women executives repeatedly forced out by all-male leadership teams and boards, I feel that lack. Just as, "theNet interprets censorship as damage and routes around it”, women interpret sexism as damage and route their careers around it. The women who consider going into tech are brilliant, and they see the same upcoming obstacles as I do. They are making the best choices they can, and the information available says to them that they are not going to be welcome. Why does this matter? Why should you care? Instead of blaming women for not having sufficient interest in technology careers, we have to honestly, humbly ask ourselves: why is tech so unwelcoming to women? What is telling women that they should not even bother to try? Anne-Marie Slaughter said that women start opting out of the highest positions because they are recognising that our society is unconsciously forcing them into an impossible position: spend the time you wish with your children, or be a successful professional. It is simply not possible to “have it all,” and yet that is the lie we have been selling women. At the earliest stages we tell girls and women that they are welcome in tech, but we tell women in the later stages of such a career that they are never going to be granted a chance at the brass ring or the big chair. Twelve-year old girls are not stupid and they can read a newspaper. Eighteen-year-old women entering college see that the six women in their high school Computer Science class just became three. The $BIG_CORP internee sees herself being relegated to the temporary workers’ lunch table instead of being welcomed by her fellow male internees to after-hours socialising – losing out on some of the key social and collegial bonds that are the beginning of networking and building a strong career. If technology keeps throwing women out of leadership roles at twice the rate it does for men, young women who can very clearly see what is happening to their role models are going to find a better and more promising use for their time and talents. What future effect on our economies and national relative competitiveness will it have if we do not fix this? The effort put into staying in tech for women is huge, and they are arguably overqualified for the roles they take, so each woman leaving a technical role represents on average a more serious loss of talent and educational investment to technology than a man at a comparative level in his career. Women clearly expressing their commitment to, and joy of, technology are leaving because they are seeing overwhelming evidence telling them they will not succeed or be promoted. The solution to this – hiring, mentoring and promoting women – is not altruism. It is good business. Companies with women in leadership roles perform drastically better regarding finances than companies without. Every woman added to a company’s board improves its competitiveness, with a notable jump at three or more women board members; speculatively because that is the place where women stop having to focus on being tokens and can actually function in their business capacity. This problem is getting some of the attention it deserves. 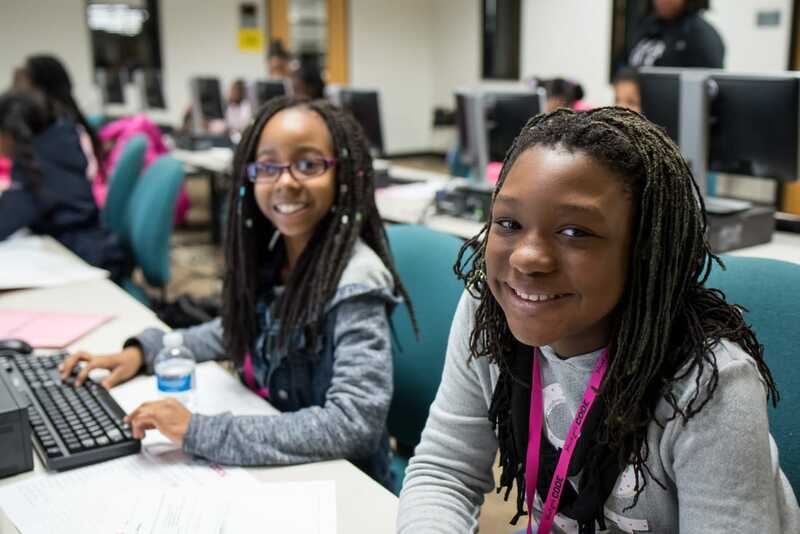 Black Girls Code is one of the best examples of resources that individual girls can find. Malala Yousafzai continues to advocate for the education of girls around the world. Emma Watson’s HeForShe is a movement that builds alliances with men who can help solve this problem. Endeavors such as these demonstrate that the issue of women not receiving equal treatment is coming to the forefront. A foundation of equal rights to the privacy of one’s person and the security of one’s data is built with diverse viewpoints. Bringing women and people of colour into tech shapes tomorrow more fully and clearly than it will be without those voices. Demanding data on diversity and inclusion will force companies to generate it, and the data shows profound financial improvement when companies include diverse employees. Equitable family leave policies are one of the best ways to support women’s careers. Equal pay amendments and having zero difference between maternity and paternity leave makes the biggest difference. If your country has social stigmas about women who work while they have children, be prepared for those women to be sensitive to signals that if they have a family they will be in dead-end jobs until they leave. Take sexual harassment cases seriously. By some measures, the #MeToo movement has tripled the number of male managers who now say they will not mentor women or meet with them in person for the vital socialising and training that moves women past each stage of their careers. Exposing one kind of profound injustice has now worsened another. Here is how to help if you are a manager or a leader in a company: randomly assign professional mentorships in groups for junior technologists with the goal of mixing genders in mentorship dyads. Train men on how to be mentors to everyone, not just women. Many are already doing it naturally, but have often never considered that after-hours socialising and talking about office politics with someone one lower level than them in the corporate hierarchy actually is sponsorship and mentorship. Continue on a personal level to support narratives that show women and girls as brilliant, instead of merely beautiful. The character Shuri in the recent Marvel movie Black Panther was a revelation; a genius inventor and young woman of colour who lived her love of technology. Captain Kathryn Janeway in Star Trek: Voyager was one of my heroes. These stories matter deeply to the women rising now in tech, seeking role models and heroes. The girls growing up today who see people who look like them in science and technology careers on film and in boardrooms in real life have the best chance at being our next crop of diverse technology leaders and role models. Let us strive as a global industry and community to reach for the equality we can now only find in fiction. Women in Men’s Roles = Equality?